While the old year came to a silent and rather unspectacular end, this fortunately doesn't count for the new year, which had some nice suprises in offer. 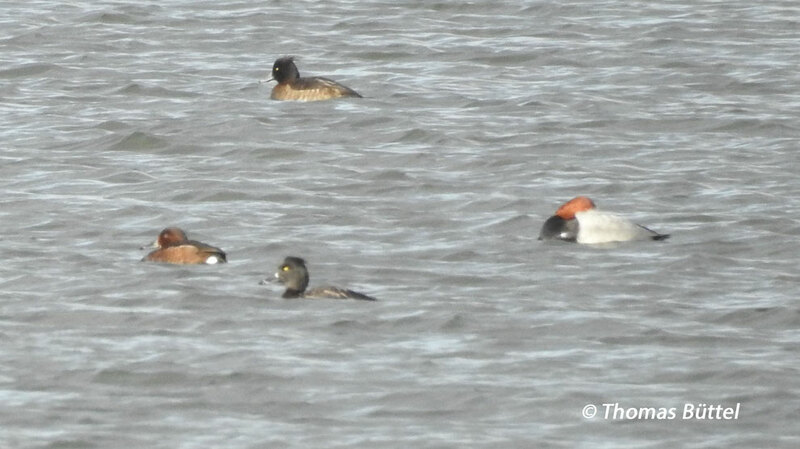 Already on the first day I was able to connect with a Ferruginous Duck on the Großer Wörth, that could easily be picked out of the far more common Tufted Ducks and Pochards. Apparently, the bird had already been a couple of days on the lake, yet it seems to have left the site meanwhile. Apart from the duck there finally two Green Sandpipers on the sandbanks, which is another good bird in the winter. As expected I've furthermore paid the harbour of Bamberg some more visits. However the observation conditions for Redpolls weren't particularly favourable. In fact, I've seen them just at a single day in the new year and they were quite difficult to pin down. I could examine only eight birds, which turned out to be all Mealy Redpolls. Probably there is just some more persistance necessary, as it is always in finding good birds. For the next days or weeks I've planned one or two trips to the large lakes in southern Franconia, so stay tuned.